ROCCAT shows off LLua, a new tri-button gaming mouse that will be shown off at Computex and E3. Lua is described as a sleek, ambidextrous mouse that offers a comfortable fit for every gamer's hand. It will ship in July/August 2012 for 29.99EUR. 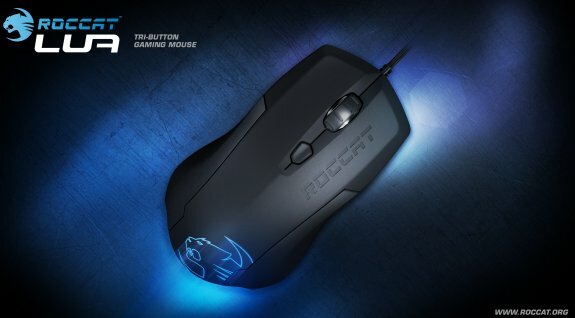 German gaming peripherals manufacturer, ROCCAT Studios, is set to unveil the ROCCAT Lua Tri-Button Gaming Mouse at the Computex expo in Taipei and E3 in Los Angeles, June 5. Described as “The Classic 3-Button Mouse: Re-Mastered”, the Lua packs advanced gaming engineering into a sleek and clean ambidextrous form that offers a comfortable fit for every gamer’s hand. “We took the beloved three-button mouse design and injected it with our innovative gaming engineering – and created a killer tool that gives props to the past while heading boldly into the future,” says René Korte, ROCCAT Founder and CEO. “The Lua delivers everything gamers need for control, comfort and style – all in a sleek and slim design that offers perfect comfort for every hand.” The Lua’s advanced Pro Optic R2 sensor features a choice of seven DPI settings – 250, 500, 1000, 1250, 1500, 1750 and 2000 – so gamers can play with accuracy at the speed that matches their style. It also has a dedicated DPI button that lets players easily change speeds in the heat of battle. Gamers can even program the button to switch only between the DPI settings they use most. The Lua’s ultra-precise 2D scroll wheel also lets gamers give every wheel command with absolute precision. Every incremental step locks securely into place, so users won’t have to worry above over- scrolling. When weapon 2 is what’s needed, a player won’t accidentally scroll too far and end up with weapon 3 or 4 – security that can mean the difference between life and death in a lightning-paced FPS. Plus, the Lua’s advanced scroll wheel delivers solid tactile feedback, so gamers can actually feel their way to more accurate gaming. The Lua comes standard with ROCCAT Driver software, which lets users easily customize their mouse buttons. And all Lua tweaking is fun and easy thanks to the program’s gorgeous and simple-to- use interface. And last, but certainly not least, the Lua is built mega-tough and state-of-the-art using only the highest-quality materials and most advanced technology. From its premium electronics – featuring Omron switches and cutting-edge encoder – to its PTFE feet that deliver low-friction gliding, everything on the Lua is built to last and designed to give players a competitive edge.